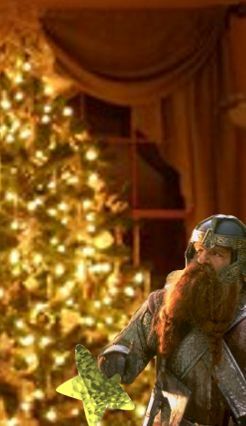 Although the secret identity of Adar Rhiw had long been guessed by both Elros and Elrond, both of them still continued to leave their boots out to be filled by the mysterious elf (who had, apparently, reindeer and a magic, flying sled, along with the ability to leap down the chimneys of lit fireplaces without being burned). It was after about a dozen years or so of living with their Uncle Maglor that the twins awoke one morning to find their candy in neat little sacks at the end of each of their beds. Wondering if Adar Rhiw had not seen their boots, the pair rushed to them to find an unexpected surprise. “Mmmm... I have to think on that still,” admitted the youth, pulling the kitten back down into his lap. Elros held his up for inspection as well when Maglor made it to the other side of the table. “Mine I named already,” he said as his uncle gave the kitten a scritch behind the ears. Down at the other end of the table, Maedhros looked up from his half-eaten breakfast. “You forgot her name already?” he asked little Elros, pointing at him with his spoon, unable to eat and point at the same time. “I will name mine Rolly because he rolls over a lot,” decided Elrond, completely uninterested in breakfast. “Or to lunch or supper,” added Maglor, agreeing with his elder brother. “Cats, crumpets, and hot liquid – no,” Maedhros sternly informed the youngster. “There you go, Rosie. Go play,” said Elros, letting go of the kitten. She thankfully leaped off of his lap and bounded to the doorway, looking over at her brother. “Oh, alright.” Elrond leaned down, planning to place the kitten on the floor, but he twisted away and ran to his sister. The pair turned the corner and disappeared. “May we play with them after breakfast?” asked Elros. The twins were left to themselves after breakfast. For a little while, they alternated between playing with the kittens and going to the window to check on their uncles’ progress. Maglor was already coming back up the other side of the path, while Maedhros slowly scraped his shovel along and then tipped it to the side when it became full. “I wish we could go out in the snow,” remarked Elros. The pair went to the back door and opened it to find a rather large drift. Some of it toppled into the house. Each scooped a bowl full of snow and brought it inside before closing the door. Already, the snow on the floor was beginning to melt. “Where should we go?” asked Elrond, holding his bowl, not about to admit that his hands were very cold and wet already. Into the kitchen they went, finding their kittens curiously sitting atop the counter, looking at the rows of spices on a shelf, and occasionally batting one off. Ignoring this, the twins each set their bowls on the opposite ends of the table. “Ready?” asked Elros, lifting up a handful of snow. Snow began to fly, though not very far. Halfway through their bowls of snow, the table had many puddles, and the twins were damp, but not much else had occurred. Then, Elrond learned something. “Look! If I pack it together, it...” He paused, looking at his snowball. Elrond smirked, and then threw his new weapon at his brother. Elros, who had been watching him, ducked in time, and the snow hit the wall, sticking to the bricks. They began anew, throwing the balled up snow and hitting quite a lot of other things besides each other. “Huh-uhhhnn!” Elrond put all his strength into throwing the snowball, which flew right past his brother and into one of the poles that held the stew over the low fire. In an instant, the poles came crashing down, followed by the stew that spilled across the floor. Any remains of snow were now gone, either puddles or enveloped into the spilled stew. The sound of the front door opening made Elros rush to put away the bowls. Elrond grabbed their kittens and held them while Elros looked frantically around. “Boys? Where are you? I have a surprise for you,” called Maglor. Grimacing at the mess, Elrond spied the pitcher of water on the counter. Nudging his brother, he nodded to the pitcher. Elros grabbed it, spilling some of the water into the basin that led right down a pipe to the side of the house, and spilled the rest quietly onto the floor, setting the pitcher on the ground. “What a mess,” said Maedhros as he came to the doorway. He was panting slightly and sweating, for although he accomplished less of the shoveling, he had to put in a greater effort. “Yes, Uncle Maglor?” they said in unison. “Go ahead and get yourselves cleaned up. I cannot hold you accountable for what these two precious little brats did,” he said, nuzzling one of the furballs.